I’ve been lucky enough to try some awesome new food products lately and just have to share them with you. First, I tried the new Chocolate Chunk Bar. 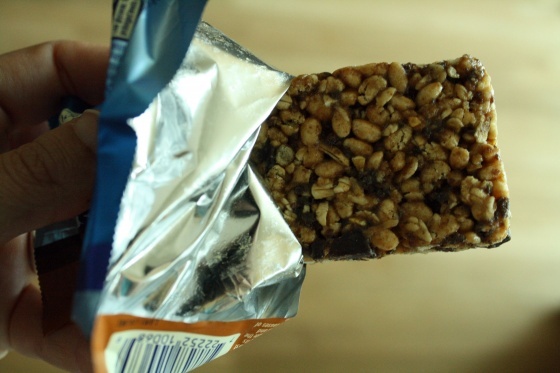 While I think most Luna bars taste like a healthy dessert, this bar tasted more like a true granola bar to me. It had generous sized chunks of chocolate throughout and was very tastey. 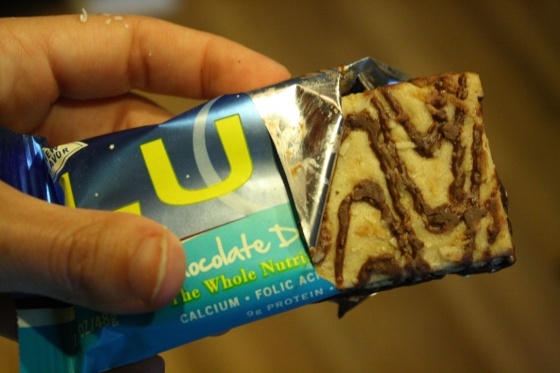 This bar has 180 calories, 9 g of protein and only 11 g of sugar, plus tons of good-for-you vitamins. My second bar was the Chocolate Dipped Coconut. Be still my heart. This was whyI was checking my mail daily. It tastes just like a Somoan Girl Scout cookie, only chewier. You know, the little butter cookies covered in chocolate and coconut. My favorite Girl Scout cookie meets one of my favorite bars. If you like coconut at all, get yourself immediately to a store selling Luna products and try this. 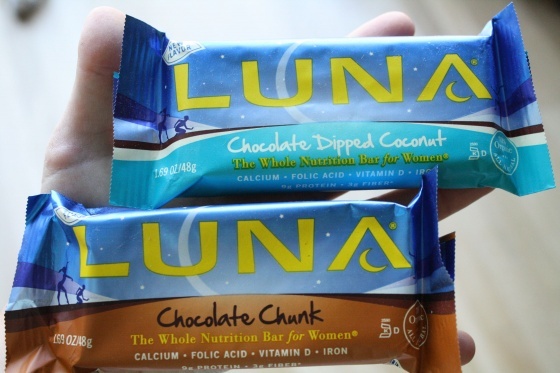 This bar has 190 calories and all the rest of the good stats from the whole line of Luna bar products. Can you tell that I like chocolate? Sorry, Chocolate Chunk. You didn’t quite make the top three cut. But, I’ll gladly eat you over most other bars. You have quite the competition in the Luna lineup. 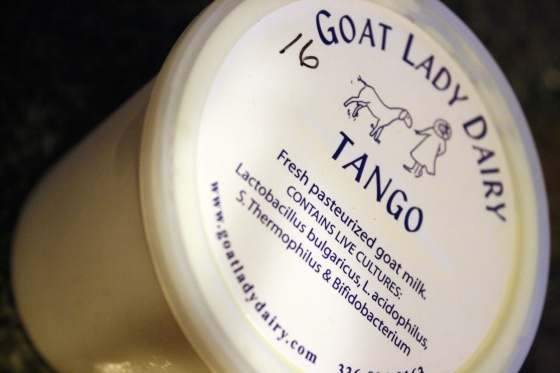 I have eyed goat milk yogurt in the grocery store many times, but have never had the courage to try it. I finally purchased a 16 oz. container after trying so many delicious products from the Goat Lady Dairy during our farm to table Dinner at the Dairy. This stuff is delicious. With a consistency creamier than cow’s milk yogurt, it makes a great topping, as I found out when I made a delicious stew. I’ve also tried it straight up and loved it. Interestingly enough, goat milk does not always affect lactose intolerant people the same as cow’s milk. So besides just being plain delicious, it might be a good alternative for you if your stomach can’t tolerate dairy from cows. Goat’s milk is actually consumed more than cow’s milk across the world, which makes sense since three quarters of the world is lactose intolerant. 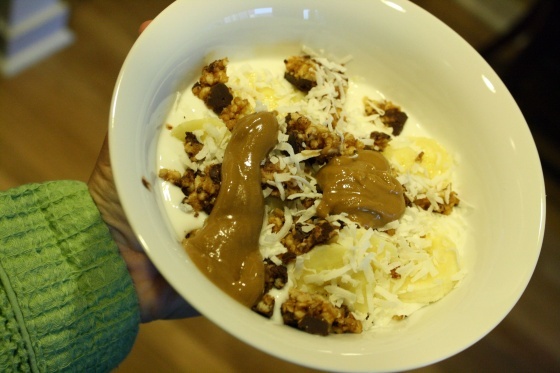 Two of my new finds became a match made in heaven this morning with goats milk yogurt as the focal point of my breakfast. When I eat a breakfast as delicious as this, I often want to write, “the best breakfast I’ve had in a long time,” and then I remember that yesterday’s breakfast was pretty delicious too. Lucky me got the chance to try another version of this delicious grain for free, when Eden Organics sent me a free 16 oz. bag of roasted and rolled Kamut flakes. I’ve tried puffed Kamut before, but this was my first experience with Kamut flakes. 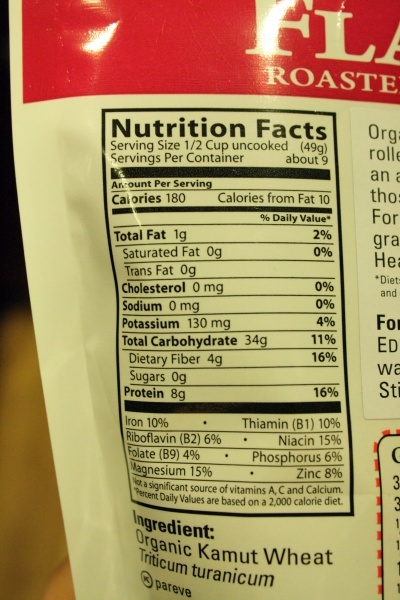 Let’s take a look at the nutrition information. For comparison, regular old fashioned rolled oats have about 150 calories, 3 grams of fat, 5 grams of protein, 27 grams of carbohydrates, 1 gram of sugar, and equal amounts of iron, thiamin and dietary fiber. The vitamin content of kamut flakes are higher. I really liked it! 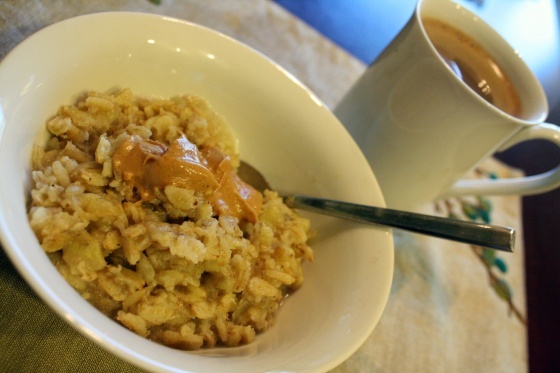 The biggest difference between oats and kamut flakes is the texture. 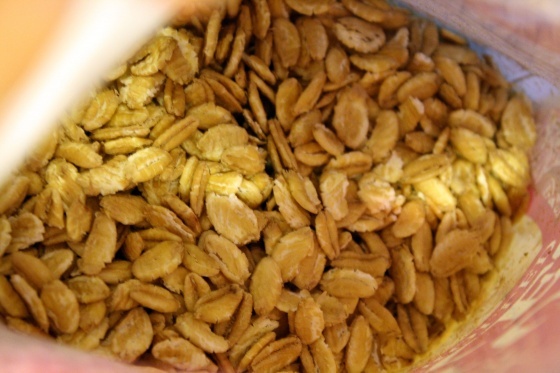 As you can see in the picture, kamut flakes aren’t quite as creamy as oats, with a heartier texture. I really enjoy variety in my breakfasts (can’t you tell?) so the different texture was a welcome change. The kamut flakes were just as filling and delicious. Plus, a little extra protein is always welcome at breakfast to help me power through until lunchtime. Eden Organics has a huge line of organic products, which you can order online. From juices, sauces, beans, whole grains, and much more, you can order all kinds of organic grocery items. If you have the space, you can save 10% by purchasing items by the case. They are a great solution if you are having trouble finding a specific item like millet or quinoa, or if your local grocery has limited organic products. They even have recipes to help you figure out what to do with the items you order. Some grocery stores also carry their products, so keep your eyes peeled, if you’re interested in trying them out yourself. All of my recent new-to-me food products have been big wins! I can definitely recommend all of these products, not only for their nutritional value, but also for their taste. What have you tried recently that you can recommend?